The main benefit of buying a welding helmet is the increased safety it provides. Welding can be dangerous, so it’s important to take all necessary precautions. 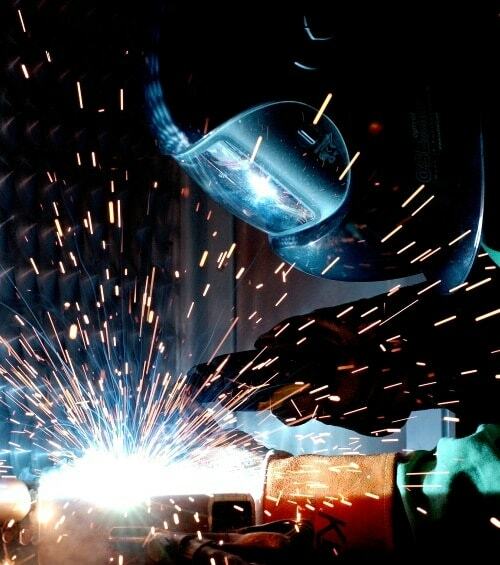 More than this, welding helmets can make your welding experience much more comfortable. Being protected means you can better concentrate resulting in higher quality work. It’s a win-win! You’re making the right decision in buying a welding helm. But which one is right for you? We can help you answer such questions with our in-depth welding helmet reviews. Here you will find out about various welding helmets at different price points, complete with pros and cons. Our comprehensive buying guide wilvl then guide you through everything you need to know in order to make your final decision. We were really impressed by the Jackson Safety BH3 and we think you will be too! The main feature of this product (much like any good welding helmet) is the lens. In this case, it’s an auto-darkening filter lens which has the very best EN379 of 1/1/1/1 which means excellent visibility. A variable shade range of 9 to 13 means that your eyes are protected from radiant energy when welding. The sensitivity and delay settings allow your lens to adapt based on where you are and what you’re doing. Basically, the lens is a big selling point of this product! The auto-darkening features are extremely reliable though we did find it unusual that there is no test button, unlike some other welding helmets in the same price bracket. Let’s now look at the whole unit. This welding helmet has a high-density plastic shell which is lightweight and allows for quick and comfortable movement. It provides full coverage of your head so as to protect from any potential weld sparks and spatters. We like that the Jackson Safety BH3 has 3 headgear adjustments. As such, you can change things up depending on the welding task you’re working on. Crucially, it’s comfortable to wear which is particularly important when welding for long periods of time. The fact that this product also comes with a 5-year warranty says it all. It’s hands down the best auto-darkening welding helmet on the market. To conclude, the Jackson Safety BH3 is simply the best welding helmet for TIG and MIG welding. Available in 10 different styles with a glossy finish (including a zombie model! ), the Lincoln Electric Viking 3350 looks fantastic. But as you’d hope with any good welding helmet, it’s more than just aesthetically pleasing. This is a top quality product that is perfect for both DIY enthusiasts and professionals. 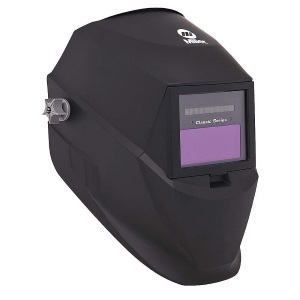 The auto-darkening lens means that this welding helmet can be used for a variety of jobs. Notably, the Viking 3350 has an optical clarity rating of 1/1/1/1 which means great visibility. Shade settings of 6-13 with a grind setting make this a welding helmet that is very versatile – you can perform almost any welding job with it. One of the most convenient features of this model is the large viewing window. Measuring at 3.74-inches x 3.34-inches, it offers an excellent field of vision. This is particularly useful when working in difficult positions where vision may be impaired. However, one downside of the large screen is that the Viking 3350 feels a little front-heavy and this can become noticeable when welding for long periods of time. Thankfully the headgear is highly adjustable to counter this. As mentioned earlier, this is a great-looking welding helmet but it’s worth noting that the glossy coating can get scratched quite easily. However, this product does come with a selection of stickers so you can personalize it which we feel is a nice touch. When you look at the price of the Antra AH6, it’s hard not to be surprised by the incredibly low price. You’d think that this would mean a poor quality product but this welding helmet surprises in a number of ways. It has an auto-darkening feature that is provided by 4 sensors which make it great for a range of welding applications. One particularly interesting feature of this welding helmet is that it’s compatible with a magnifying lens of 2 x 4-inches. Such a feature offers additional visibility when working on more precise, intricate jobs. We mentioned the auto-darkening feature but what we haven’t yet told you is that there’s also a solar power assist feature. This is a very interesting addition because it allows you to essentially keep on working when battery power runs out. One thing that may discourage some potential buyers is the viewing window. At 3.86-inches x 1.73-inches, it doesn’t provide the field of vision of more expensive products. However, it’s respectable enough when you consider the very low price. Made from high impact polyimide nylon, it’s fairly durable though it’s worth emphasizing that these materials are cheap and cannot be expected to offer substantial longevity. However, this helmet is incredibly light. In fact, it weighs just 1 lb which makes it one of the lightest welding helms on the market. If you’re on a budget, choose the best welding helmet for the money! All in all, this is one of the best welding helmets under $100 as of right now. Despite the fairly simple design, we think that the Miller 251292 is sleek and elegant which never hurts! 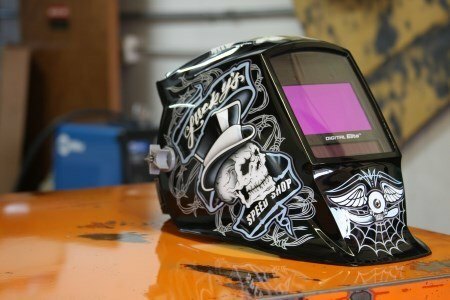 Unlike some other welding helmets, there aren’t any flashy graphics. Instead, this product focuses on performance. 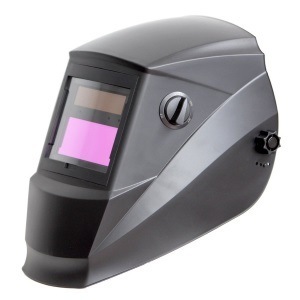 The auto-darkening feature of this welding helm has an analog control and is powered by AAA batteries. You can expect a runtime of around 2000 hours which is pretty respectable. Aside from battery power, there’s also a solar power option which is always a nice addition. Variable lens shades of 8 to 12 mean that this welding mask is suitable for a variety of welding tasks but may not be suitable for heavy-duty welding as it lacks a dark enough shade. Comfort plays an important part in the use of a welding mask and this product is pretty comfortable. This is down to the nylon material used and because it weighs just 2.1 lbs. Keep in mind that some customers have claimed that the tension adjustment is problematic but these comments are in the minority. Overall, this seems to be a durable enough product that offers a nice compromise between the budget and premium options on the market. Because it’s fairly easy to use and offers good protection, we particularly recommend this welding helmet for beginner welders. Yet another budget option for you to consider is the Instapark ADF Series GX-350S. This is a solar-powered welding helmet and has an auto-darkening feature which changes from light to dark or dark to light very quickly indeed. At 1/2/1/3, the optics are not as clear as premium products on the market but they still provide enough optical clarity to get the job done. The viewing screen is on the small side but has variable shade adjustment of 9-13 and a resting shade of 4. This welding helmet is, therefore, suitable for Stick, MIG and TIG welding. Weighing 1.7 lbs, this is a lightweight welding helmet which makes it much more comfortable to wear, particularly when welding for hours at a time. A ratcheting headband and padded interior help to provide a custom fit which is surprisingly comfortable for the low price. In our opinion, some of the adjustments are a little flimsy but this isn’t unexpected with such a cheap welding helmet. In terms of the design of the helmet, there are a number of options although one of the most popular is that of the American Eagle! If you’re unsure about this product then you at least get a 2-year warranty which should provide some comfort. On first glance, it might seem like all welding helmets are pretty much the same. In reality, nothing could be further from the truth. As reflected in the vast difference in prices, welding helmets can vary a great deal from their very construction to the features they include. But there’s no need to feel overwhelmed. We’ll now take you through everything you need to know! There are essentially two main types of welding helmets: passive welding helmets and auto-darkening welding helmets. Passive welding helmets are also referred to as standard or traditional welding helmets. This type tends to be cheap, especially in comparison to auto-darkening welding helmets. Made from molded plastic, they have a viewing lens that typically has a shade of 10. The dark tinted glass has ultraviolet and infrared coatings to protect the eyes of the user. Passive helmets are worn in the upwards position when positioning the gun or torch. It can then be flipped into position. Flipping the helmet up and down like this can be annoying and uncomfortable. What’s more, it may not be possible when welding in certain positions. Much more advanced, auto-darkening helmets tend to be more expensive as a result. However, we feel that they’re worth the additional investment. They are light reactive and often have a viewing lens shade of 3 or 4 when inactive (to allow the user to easily see through it) to the darker shade of 13 when welding is producing particularly bright light. The fact that you can so easily see through the viewing lens in different lighting conditions means that there’s no need for flipping the helmet back and forth. This is much more comfortable and avoids issues such as neck fatigue. One minor disadvantage of auto-darkening helmets is that they require batteries which is an additional cost to consider. The fact that this type of helmet is the most popular, is the reason why this page only consists of auto darkening welding helmet reviews. However, we are currently working on a rundown of the best passive welding helmets on the market, that will soon be published. With regards to shade, it’s possible to find welding helmets that are fixed shade or variable shade. Fixed shade welding helmets are less expensive and automatically darken to a fixed shade of 10. This is most suitable for people who are consistently cutting the same materials using low amperage. If your welding is likely to be more varied, a variable shade makes a lot more sense. With a variable shade lens, you’re provided with many shade options. Variable shades offer the best protection as they can adapt to more welding situations. The viewing size of your welding helm is very important. In fact, it becomes more important based on the sort of positions you’re welding in. The viewing area of your welding mask could be anything from 5 square inches right up to 10 square inches. One thing to keep in mind is that the bigger the lens, the heavier the helmet can be at the front. If you’re wearing your welding helmet for a long period of time, this can become more noticeable and even uncomfortable. You can also expect helmets with bigger lenses to be more expensive. The quicker that your lens reacts to changes in light, the better it is. This is because it better protects your eyes from sudden bursts of light that could prove to be damaging. While welding helmets with faster lens reaction times tend to be more expensive, they’re well worth the extra money. You can expect lens reaction times to be anything from 1/3,600 of a second to 1/20,000 of a second. By paying more for a faster lens, you’ll have greater comfort because your eyes will be less exposed to bright light. The sensors in a welding helmet receive the changes in light and communicate that to the lens shade. As such, these are of vital importance in protecting your eyes when welding. Most budget welding helmets should have at least two sensors while the more industrial options may have as many as four. In most cases, two sensors should be enough but when you’re working in different positions, sensors can get covered up somewhat. Therefore, it can’t hurt to have more sensors to ensure that your helmet changes shade at the right time. For the most part, the auto-darkening feature of welding helmets works very well. But sometimes it can require some fine-tuning. For this reason, it’s good to find a welding helmet that has adjustable sensitivity control. This allows you to adapt to different situations based on your environment. Examples include other welders working your area and the presence of natural sunlight as well. Sometimes the helmet might not darken quickly enough or it may be too fast for your like. This is your way of controlling it. Very much linked to sensitivity control, the delay control can also prove to be very useful. This allows you to set the time that your lens should stay dark after arc work is completed. The delay you set is really down to the type of welding work you’re doing and how many amperages it involves. You can usually set it from anything from .25 or .35 of a second for a fast setting to .6 or .8 for a slower setting. The flexibility this feature offers is very useful. Many welding helmets are battery powered. Thankfully, the best products don’t consume batteries too quickly and thus can potentially last thousands of hours. Those that require charging obviously require electricity so this is an additional cost to factor into the equation. Good batteries shouldn’t be too heavy as you don’t want them contributing too much to the weight of the helmet. The lighter the helmet, the more comfortable it is to wear and the less fatigue you’re likely to experience. If you’re not too keen on battery powered welding helmets, you may find the solar power feature of interest. This is not available on all products and is by no means an essential feature. However, it gives you the chance to keep on working when the battery option runs out. At the end of the day, it never hurts to have a backup source of power since unscheduled breaks can be a real annoyance. The weight of a welding helmet has a great influence on the level of comfort you experience when welding. Modern-day welding helmets are designed with comfort in mind and, as such, can be as light as 1 or 2 lbs. Protection is the most important thing but if you can have great protection while also reducing potential fatigue then that’s obviously even better. Remember that the lens of a helmet can add to the overall weight and this can make the front heavier. While weight plays a big part in the comfort of your welding helmet, so too does the adjustability. There should be plenty of options when it comes to adjusting your helmet. More than this, they should be strong so that they keep your welding helmet on, no matter the position from which you’re welding. While welding helmets all serve the same purpose, each product can vary significantly. From the various features it provides to the price, you can expect a wide range of choice. Having so many different options is great but it can make the decision all the more difficult! How are you supposed to separate one product from another, for example? By following our reviews of welding helmets and the information in our buying guide, you will surely find the right welding helmet for your needs. Remember, you don’t necessarily need to spend big to find a quality product but if you want to have all of the bells and whistles then be prepared to pay a little more.